There are books you pick up with no idea of what to expect...and sometimes those end up being the best reads, the ones you didn’t even know you needed. 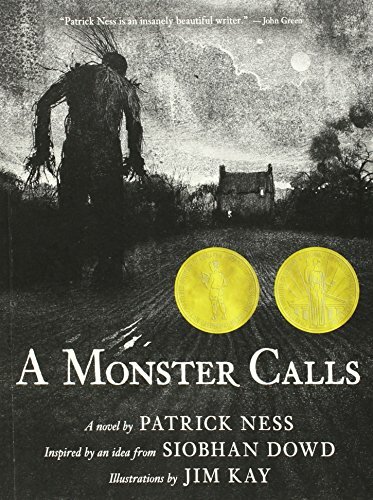 A Monster Calls by Patrick Ness, based on an idea by late YA author Siobhan Dowd, has the added poignancy of Dowd’s own lack of time, her untimely death at the age of 47 after writing only 4 novels (all highly acclaimed). Winner of the Cilip Carnegie Medal, I finished it in a few hours---stunned and blindsided by the sheer power, emotion and depth of this deceptively simple story. I’m trying to remember the last time I cried so much while reading a book and coming up with a big recent blank. “An extraordinary novel of love, loss and hope” is what the blurb says. But how do you review a book of this nature without spoilers? How do you put in words the emotional turmoil that engulfs you without so much as a warning? Our 13 year old protagonist, Conor O’Malley, lives with his mum who is sick. His father’s in America with his new family. His maternal grandmother comes to stay when the mum needs help. He doesn’t have many friends, but a set of school bullies. Up until then, it’s been him and his mum against the world. But now everything’s changing, and coming to terms with it all might mean facing the most difficult truth he’s had to face, that he will probably ever face. We are plunged right into Conor’s living reality. The story opens with a visit at midnight after a recurring nightmare. This “tree monster” is none other than the old yew tree near the railway tracks across from their house. Conor doesn’t know why it’s there, what it wants or even if it’s not just a dream his fevered brain’s imagined. That’s the first time. From then, the monster visits him at regular intervals, always at 12.07, and we sense that Conor, despite his initial instincts, comes to depend on these visits, on the company, especially as his mum gets worse. Especially as all his latent anger, hurt and frustration bubbles up and over. Even as his isolation from the rest of the world increases, though they treat him more gingerly than ever. Not only are the stories themselves paradoxical and confusing, but we can also only guess the truth that is at the heart of this narrative. Even with more of a glimpse into the nightmare, we can never imagine the real reason why Conor covers up for his tormentors at school, why he believes he doesn’t deserve any sympathy, kindness or understanding about his mother’s illness, why he feels crippling guilt and wants to be punished. The final revelation allows us to see the real reason why the monster has come. There are hints throughout the book that Conor is subconsciously aware of the reality, that he’s known it from the start; a part of him accepting it even. But he hasn’t fully reconciled with the contradictory nature of that truth. He hasn’t fully accepted it or forgiven himself for that one particular thought. And that’s why it’s the hardest thing of all for him to vocalise. Because he believes that would make him a terrible human being. When all he is doing is responding to a very common, innate human desire – the end of pain and suffering. And it’s only by vocalising it that he can ever hope to find peace. Conor’s a wonderfully fleshed out character---a curious sort of defiance mixed with bravery mixed with vulnerability that increasingly tears at your heartstrings---and the main focus of the story, but his parents, Lillian (his only friend) make for engaging if not slightly two-dimensional characters and I was surprised at the depth Ness managed to inject into the grandmother. There is a vibrancy to the descriptions (I loved the idea of a living, breathing nightmare) that brings the story and its characters to life and tears us apart with its blisteringly raw exploration of grief. There are however some wry, even darkly funny moments in Conor’s exchanges with all of them that add certain “levity” (best word I could come up with) to the otherwise heavy theme. Patrick Ness’s skill is in how all of this, including the brief yet fitting chapter names, is ultimately effectively simple. Then Lily’s mum knew, of course. And then everyone knew. Everyone. Which changed the whole world in a single day. “Simple words for a complex truth” could be another tagline for this book that’s wise without being preachy, wryly funny without being bitter, and told in a very simple language that belies the depth of its characters and the strength of its narrative. A Monster Calls is a heartbreakingly compassionate and beautiful book about love, hope, loss, grief, healing, the wild beauty of stories, and how to survive when it seems impossible.